Everyone knows that hens -- female chickens -- lay eggs. But not everybody fully understands how chickens reproduce. Not every egg a hen lays is capable of hatching into a chick. The better you understand your hens' reproductive capabilities, the more likely you are to hatch healthy chicks. A healthy adult laying hen will lay one egg every 24 to 27 hours most of the year, regardless of whether she has been exposed to a rooster. But the eggs will not be fertile if the hen has not physically mated with a rooster. They will make an omelette, though. If a hen has not mated with a rooster to receive his sperm, the hen's eggs are incapable of forming chicks. The yolk of a hen's egg forms while ovulation is taking place in the hen's ovary. When the yolk is fully formed, it releases into the oviduct, where it is fertilized by stored sperm. The egg white and the egg shell develop around the yolk as the egg travels through the oviduct. Once the egg has finished traveling through the oviduct, the hen will lay it. Hens have to be in the right mood to incubate eggs. A hen who is willing to sit on eggs, regularly turning them and keeping them warm, is referred to as broody. Hens can go broody regardless of whether they have mated with a rooster. A broody hen provides all the care an egg needs to develop into a healthy chick. 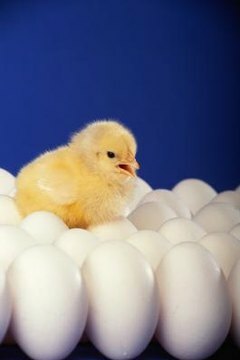 If you do not have a hen willing to care for the eggs, you can place fertilized eggs in a specially designed egg incubator to keep them warm and cared for until they hatch. It takes an egg 21 days to hatch after it has been laid. When it is time for an egg to hatch, the chick will use the "egg tooth" at the end of the beak to break through the shell, and the chick will then push out of it. Once the chick has left the egg, your hen will keep the chicks warm, show them how to find and eat food food as well as teach them an assortment of behaviors that they will need to survive as adult birds. Do You Need a Rooster for a Hen to Lay Eggs? What Kinds of Chickens Are Brooders? How Do Eggs Form Inside a Chicken? What Time Do Hens Usually Lay? How Long Does It Take for Chickens to Mature? What Happens When Eggs Aren't Incubated? What Are the Functions of Wattles on Chickens?